You know that feeling when you get something really special? You’re proud to have it in your home, excited to show friends, family and guests, and there’s a kind of joy each time you see it and realize all over again that it’s actually yours. This is the feeling you get when you know something was made with care, with passion – when something was made the right way, the Schweitzer way. For us there is no other way. For over 48 years we’ve spent our lives finding new ways to give customers that special feeling. But making products that look and feel special is not an easy task. If it were, maybe you’d find more products with the kind of quality and craftsmanship ours have. Making products that feel this special takes time, determination, skill, a good amount of discovery and a willingness to pay extreme attention to the tiniest of details. Everything has to be done right, from fabric creation to the final embroidery. It’s these details that have continued to set us apart from the rest and made it possible to give our customers bedding that is incredibly special and worthy to be in their homes. Just like a fine wine or gourmet dish, the root of quality and experience lies in the ingredients. Because this is the foundation of greatness we make sure every single material that goes into making our products is the best. We don’t mean the best of what we can get, we mean the best of the best. If it’s not good enough, it doesn’t get used for our sheets. A majority of our fabrics are made in Italy, where they have literally mastered the art of weaving, resulting in lighter, softer and more sumptuous linens. We use long stem cotton because the longer the fiber, the stronger, softer and more resilient the fabric, plus no pilling. Long stem cotton gives our sheets incredible softness and texture, a lighter, more airy weave and a strength and durability that allows for our sheets to feel just as luxurious after years of use. This means many nights of comfortable, rejuvenating sleep. We don’t cut corners, literally. Lots of people claim to go the extra mile when they create their products but ask them to prove it and you’re likely to be disappointed. For us, the extra effort and cost that goes into making our sheets is easy to prove. All you have to do is take a closer look at our flat sheets. The edges have mitered corners that are invisible on one side, with European returns, plus the edges are perfectly hemmed, not salvaged. 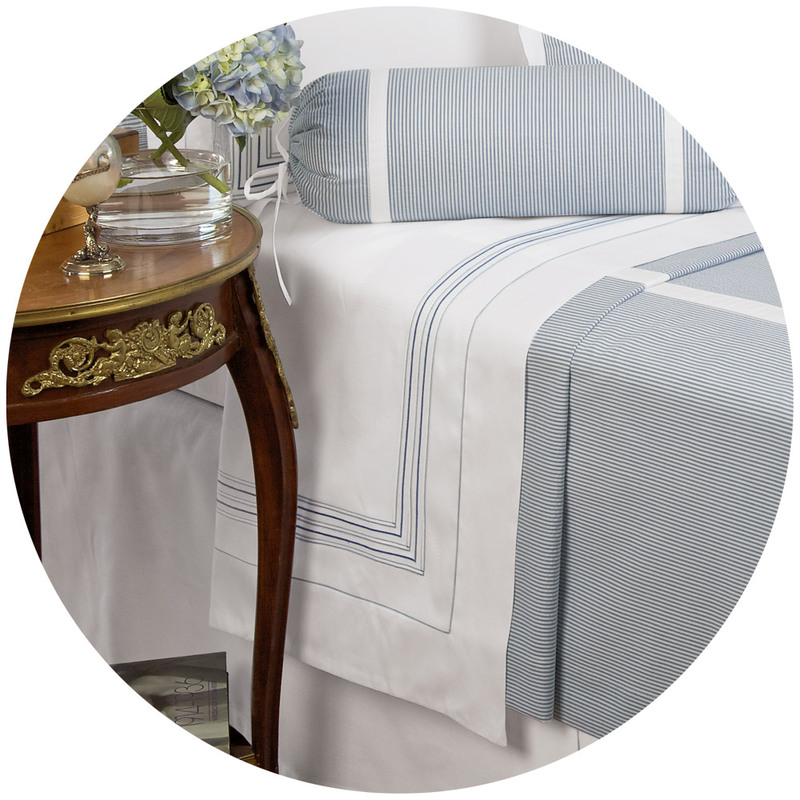 This not only gives our sheets a beautiful finish but makes them extremely durable. 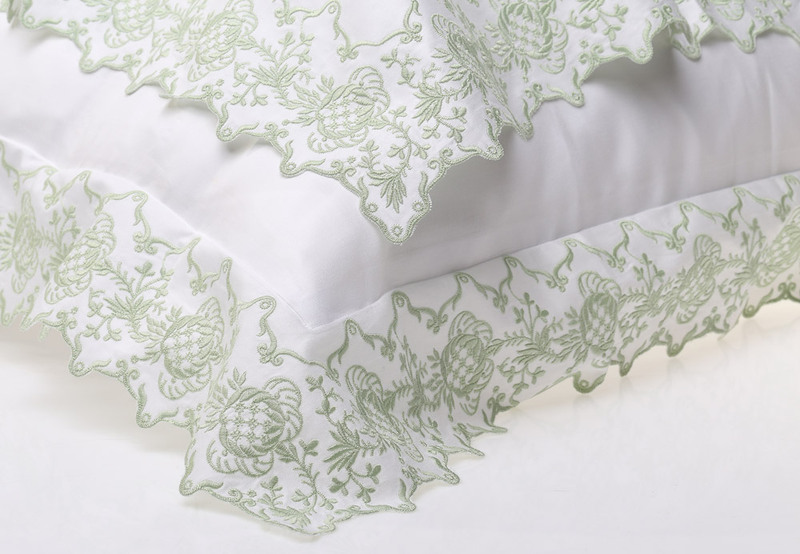 Our duvet covers feature flanged borders or scalloped edges with 3-sided embroidery and button enclosures. The attention to detail for each design is incomparable to other brands. And while almost every other sham you’ll find out there with flanged or scalloped edges are done on three sides, our shams feature four. This is much more difficult and not typical for most bedding. It’s a difference you’ll instantly notice and continually appreciate and it’s one of the many details that makes our shams a notch above the rest. The finest materials can only take you so far. If they are not put together properly, the end result is going to be poor and the experience lacking. So after we procure and create our top-of-the-line materials, we turn to our artisans and experts to weave and craft our fabrics, using the best weaving techniques in the world. How do we know this? Because it’s the same way we’ve been doing it for over four decades and we have perfected the process through years of trial and error. Everything we make gets a hand touch to ensure it’s worthy of our name and your time. But comfort is only part of the story. If your sheets don’t look as good as they can, you’re not going to feel as good as you can. Colors need to do what they are meant to, whether that’s bold and vibrant, or soft and calming. So we dye our fabrics the same way a professional painter paints a house, coat by coat, until it is perfect. Using experts who have mastered the technique for generations, we painstakingly apply the dye until we can be 100% sure that the color, shade and consistency is perfect and long lasting. That’s why the coloring on our sheets please our customers, even those who have had them for many years. We also finish our fabrics using practices that adhere to the highest of standards. So you can be sure that what was luxurious before becomes even more lavish and beautiful. 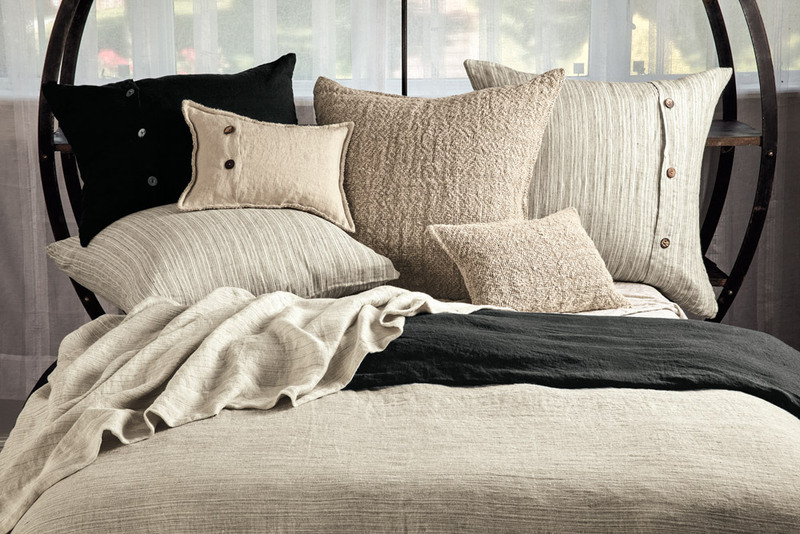 There’s a reason our bedding has stopped many in their tracks as they walk by someone’s bedroom. The finishing on our sheets delivers that wow effect that can turn a simple room into an icon of sophistication and style. 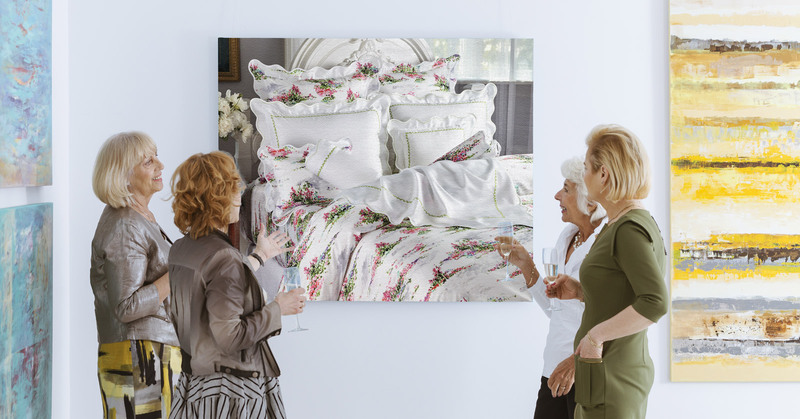 Whether you’re looking for sateen, linen, percale, damask or something else, every piece and style of fabric we produce is in itself a work of art, but that, as they say, is just the beginning. Want to know how you can tell if a bedding company is serious about their products or not? Check the embroidery. Bad embroidery not only looks bad but will often greatly reduce the life of a product. Of course, with that sort of quality, maybe that’s not such a bad thing. We use the same detailing we did nearly 50 years ago. Our process for embroidery takes many more steps than most. That’s because every minute detail from the number of stitches to the size of the footing is given our utmost attention. 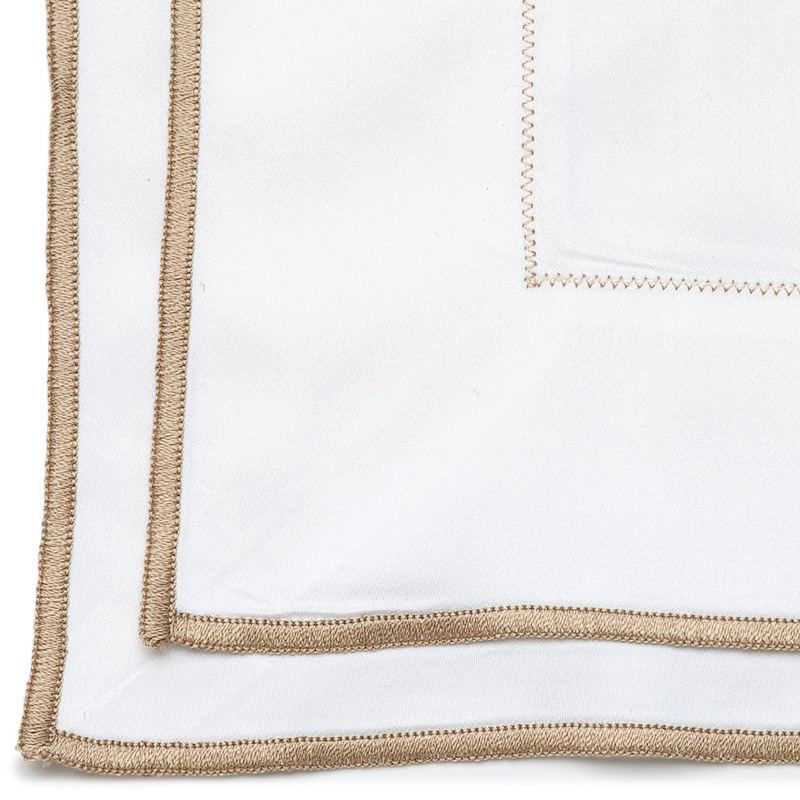 And like the corners of our sheets, our embroidered top sheets have European returns and our shams are embroidered on four sides for exceptional quality and appeal. Many of our designs are hand-embroidered, all done with the precision and dexterity only true artisans can provide. The details are exquisite and it’s one of the reasons people come back to us year after year. Modern, heritage inspired, graphical, it doesn’t matter what the style is, if it’s embroidered we take all the right steps and then add several more to make sure it is perfect every time. 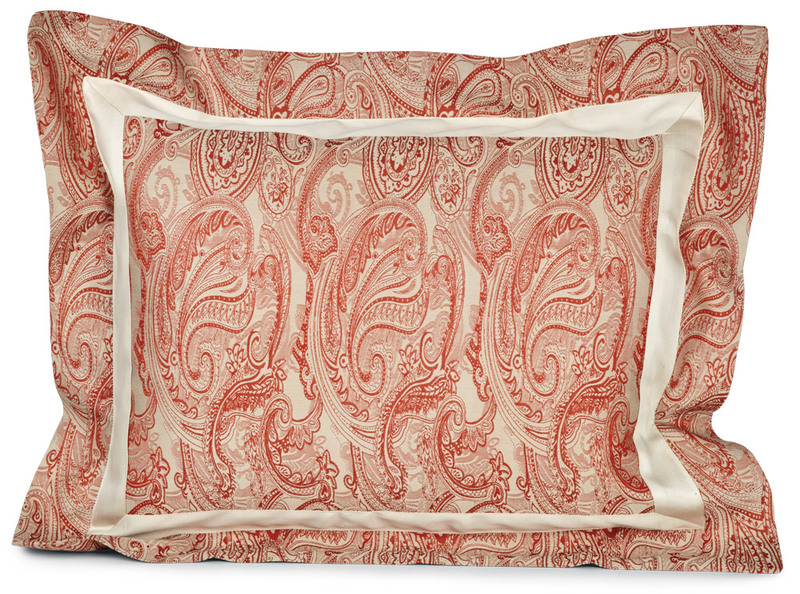 Speaking of designs, this is yet another area where Schweitzer Linen can offer something no one else can. We find our inspiration from all over the world. We visit museums, gaze upon architecture, discover ancient patterns and see marvelous things in nature that we turn into our exclusive one-of-a-kind prints and embroideries. These patterns, colors and graphics transform your room into the place you’ve always dreamed of having. You’ll quickly make it the first stop on every guest tour, so they can marvel at its beauty and charm. You deserve to feel proud of your bedroom and home. We’ll make sure you are. In addition to being able to make your room look as fabulous as you want it, our designs and colors are meant to make your room feel the way it should too. The right room will perpetuate the right emotions, which can result in more restful, rejuvenating sleep, increased wellness and calm, less stress and negativity, and a feeling of beauty, confidence and overall positivity towards everything. We’ve said it before, our designs don’t just change rooms, they change lives. With thousands of bedding options to choose from, in styles from the most contemporary to the most classical, there is a design that will perfectly match your room and decor desires. And if we don’t have it, not only are we a small family run business, we’re vertically integrated, so just give us a call or send us an email and we’ll custom make it for you. Try doing that at another bedding company. We know perfection is not attainable but we still wake up every morning trying to achieve it, and getting closer and closer to doing so. We do this because we believe in what we do. We believe in our products and the joy and happiness they can bring. And we believe that everyone in this world from small town main street to big city boulevards could use more joy and peace and beauty and luxury in their lives. We call the kind of quality we produce “museum quality” because each piece that ends up on your bed or somewhere in your home is a work of art we designed specifically for you, for this specific time in life. Your satisfaction is our mission and we will continue to reach far beyond the standards to come as close to perfection as we can for you and your family. Please let us help you find your perfect environment. When you do, you’ll instantly become part of the extended Schweitzer Linen family. That means the Schweitzer way, becomes your way.